Pool liners near Birmingham, AL, are an essential element to keeping your swimming pool looking beautiful and running in top shape. If you notice the liner is starting to look a little dingy, or the pool has been slowly losing water, call your pool and spa installation company for a custom-made liner. Vinyl pool liners are a necessary part of your pool, but that doesn’t mean you can’t choose a beautiful design. Whether you want bright blue, dark green, or black granite to shine through the water, you can have it. Maybe your tastes run toward the historic, and you’ll choose a design reminiscent of the Roman baths; perhaps you’re more simplistic and would enjoy a tiled or wave look lining your pool. Whatever your preference, you can find it in a vinyl liner. When you notice your pool liner is in need of updating, or you simply want a change, call your professional pool and spa installation company. Pool liner installations should always be trusted with the qualified professionals. The great thing about swim spas is that they allow you to customize your exercise routine. Instead of reaching your peak swimming speed or continually adding laps to your routine, you can stay in one place. With adjustable jets, you can change the amount of resistance and current coming at you as you swim against the jets. You won’t need to turn around and swim laps to constantly improve; you just have to focus on what you love: swimming. If you want to host a barbecue and swim party, your swim spa will do the job perfectly. When you want a cozy, intimate evening in a hot tub, jump in your swim spa. No matter your preference, you’ll find it. You may not be able to dive in a swim spa, but a rousing game of volleyball or “Marco Polo” is still a fun possibility. Also, when you want the benefits of a pool, but you don’t have the backyard size to accommodate one, swim spas are the perfect option. Swim spas come in an above-ground or in-ground option. If you’re going for an in-ground installation, their compact and whole construction allow for a quick, easy install. When you have the above-ground option, you can pack it up and move it anywhere around the yard or to your new home without problem. Either way, you’ll be happy you invested in a swim spa. When it comes to pool supplies serving Birmingham, AL , no one can use them quite like the professionals. Your swimming pool should get the best quality of service because you and your family—who swim in it regularly—deserve the best. In this video, you can see that letting a pool professional install parts, complete repairs, and handle regular water maintenance is the safest choice. Much of what keeps your swimming pool looking clear and beautiful is with the help of chemicals. Pool professionals are trained to work with these chemicals. Leave the pool maintenance to the professionals, so that you can feel safe when you go swimming. The spring season is just around the corner, and now is the perfect time to start considering installing a swimming pool on your property. As you are planning your swimming pool installation, you may want to consider selecting an above ground pool. Above ground pools offer the luxury and convenience of a traditional pool, without the need for extensive excavation or landscaping. A company offering swimming pool designs in Birmingham, AL , will be able to answer all of your questions about the benefits of above ground pools. To help you get started on your pool installation, here is a look at what you should know about above ground pools. 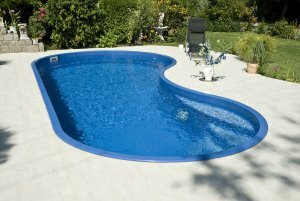 One of the best benefits of an above ground pool is that this type of pool is very cost-effective. When you choose an above ground pool for your home, you will be able to install a luxurious new pool, without breaking the bank. Today’s above ground pools are made from high-quality materials, but are still more affordable than inground pools. Along with being very budget-friendly, above ground pools also offer terrific convenience for the homeowner. When you install an above ground pool, you will be able to fit your pool into a variety of spaces throughout your backyard. For those homeowners who are seeking pools that do not require extensive preparation or planning to install, above ground pools are a natural selection. In fact, your above ground pool installation can be completed in a day or less. When you install an above ground pool on your property, you can rest assured that your new pool is very durable and weather-resistant. A modern above ground pool is made from technologically advanced materials that can withstand extreme heat, cold, and other weather events. With the proper care and maintenance, you can rest assured that your pool will remain in great shape for many seasons to come.